Make sure the turkey is thawed and giblets and neck have been removed. Stuff the turkey, loosely, with stuffing mixture. 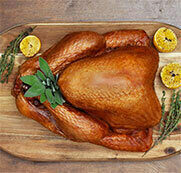 Place the bird into your roasting pan. Add wine and broth. 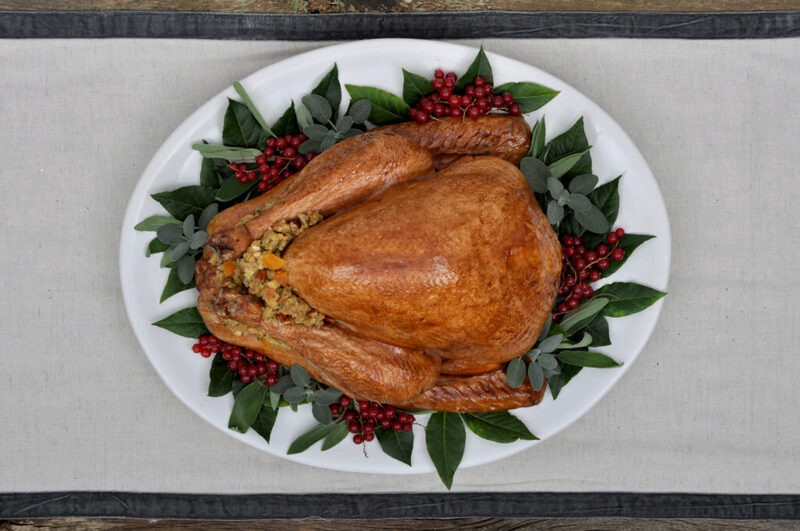 Roast the turkey for 4 – 4 ½ hours, until the juices run clear and an instant thermometer reads 170°F in the breast, 180°F in the thigh and the stuffing reaches 165°F. Remove the turkey from the oven and let it rest for at least 20 minutes before carving. NOTE: Cooking times are for planning purposes only – always use a digital meat thermometer to determine doneness. Prepare Stuffing: Spread the bread cubes out on a baking tray and place in your oven overnight to dry out. Heat olive oil in a frying pan over medium heat. Add onions and celery and sauté until soft, about 5 minutes. Sprinkle broth over bread to moisten. Add onion and celery mixture. Add oats, apricots and dried herbs. Mix well and proceed to stuff your bird.